The quintessential novel of the Lost Generation, The Sun Also Rises is one of Ernest Hemingway's masterpieces and a classic example of his spare but powerful writing style.A poignant look at the disillusionment and angst of the post-World War I generation, the novel introduces two of Hemingway's most unforgettable characters: Jake Barnes and Lady Brett Ashley. The story follows the flamboyant Brett and the hapless Jake as they journey from the wild nightlife of 1920s Paris to the brutal bullfighting rings of Spain with a motley group of expatriates. First published in 1926, The Sun Also Rises helped establish Hemingway as one of the greatest writers of the twentieth century. Whenever I think of Hemingway, I think of that scene in 10 Things I Hate About You when Kat says ‘Romantic? Hemingway? He was an abusive, alcoholic misogynist who squandered half of his life hanging around Picasso trying to nail his leftovers.’ What a great movie… Anyways, I still kinda sorta like Hemingway regardless. Right-o. 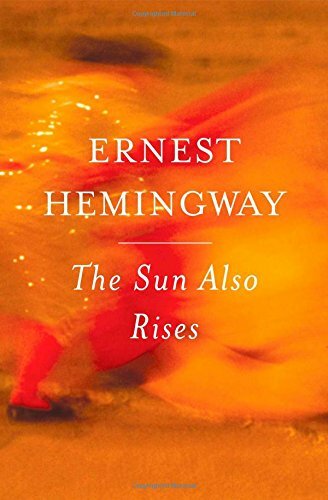 The Sun Also Rises by Ernest Hemingway is considered to be one of Hemingway’s great works and it’s not all bogged down in purple-y prose, therefore my kind of classic. Therefore, on my Fill In The Gaps Project List. Also, I tried to read this in 8th grade for a project on the Roaring 20s, but gave up because I didn’t understand a thing. SO, The Sun Also Rises by Ernest Hemingway is about a bunch of expatriates just chilling out in Paris after The Great War. Can I just say right now that these people are living my dream. They hang out in cafes/bars all day drinking beer and wine, IN EUROPE. Basically it’s a good time, except well, everyone is dealing with disillusionment and such. Also they are all GO TO HELL consistently, then they drink and all is better. Right, so the narrator of The Sun Also Rises is Jake Barnes. Jake is a pretty cool guy. I mean, he pretty much is an observer, the book begins not describing Jake, but describing another character, Robert Co. However within like the first 10 pages of the book we learn that his balls or manbits got injured in the war, so he can’t get it up, therefore can’t have sexytimes which you should memorize when you are reading the book, otherwise your understanding may be a bit off. Central also to the story is this female named Brett Ashley. Brett Ashley is pretty much a flapper what with her bobbed hair and all. However, she is also strong. She doesn’t stick around in a bad relationship. I know people are all MONOGAMY that’s what’s up. But, really, should you stay in a relationship that just isn’t right or when someone is abusing you? No. So, while some may criticize her, I applaud her for appealing to my modern sensibilities. Anyhoo, Brett is way into Jake but they can’t hook up for obvi reasons. AND with that background, I think your reading of of The Sun Also Rises by Ernest Hemingway should be greatly enhanced. For the most part, I quite liked this book, The Sun Also Rises. I liked that it wasn’t bogged down with extraneous, unnecessary words like this sentence. The story was relatively interesting, what with fishing and Europe and Bull-fighting. And, well, I liked how complex the characters were. I mean, yes there are things not to like such as the anti-seminism. And I suppose if you aren’t down with beer, you probs would not be down with this. In all, not a bad classic read. I really liked The Old Man and the Sea. I don’t know why I didn’t keep reading him, though. Becky (Page Turners) recently posted..The results are in on labels in the sidebar! I LOVE 10 Things I Hate about You, probably my favorite teen comedy from the ’90s. And yes that Hemingway quote stuck with me, although I didn’t read him till last year. We had to read The Old Man and the Sea and that was just awful. But I feel as though I should give ‘classic’ authors a few chances so I added this book to my TBR along with Farewell to Arms. so maybe I will finally understand why people like Hemingway? This is one of the books that you probably appreciate more when you read it for the second time, especially if the first time you were forced to read it for school. I have found that I have appreciated all the books I read when I was younger when I read them now. This is one of those books that I hated in High School. After reading it 3 more times as an undergrad, I finally started appreciating it for what it had to offer, and I have actually used excerpts of it in the classes that I teach now- the bullfighting section in Spanish classes and some of the Paris stuff for my Humanities classes. It definitely has its redeeming qualities. I can’t say that for all of Hemingway’s stuff, though. Can anyone please explain to me why did she call Hemingway a misogynist, and what does the phrase “nail his leftovers” means?